AirDroid 3 Is Officially Released! New version! 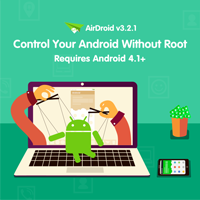 AirDroid v2.0.1 is live in Google Play: https://play.google.com/store/apps/details?id=com.sand.airdroid What’s new: 1. Fixed bugs causing issues under certain environment that when signing into web.airdroid.com AirDroid connects the device via Remote Connection Mode instead of LAN Connection Mode. 2. Fixed bugs causing FC for certain devices. 3. Other bugs fixes and improvements. Best Pokémon Quest tip ever! AirDroid is now on iOS! [New] AirDroid Windows/Mac 3.5.2 brings you a better and easier “Files”! [Announcement] PC 3.5.0 brings file management to your desktop! AirDroid makes your multi-screen life easier and more focused by helping you access and manage your phone from any computer, anywhere. You can send SMS, view app notifications, transfer files and fully control your phone on computer with AirDroid.